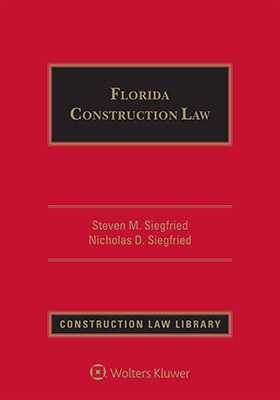 In this essential one-volume desk reference, the leading Florida construction law authority synthesizes all of the relevant cases and statutes into the most thorough analysis of Florida construction law and Florida construction lien and bond law available today. And Florida Construction Law gives you numerous sample lien-related forms that will save you time and effort in your construction law practice. It explains when to use each form, what information to include, and much more. It also contains the full text of the Florida Construction Lien Law.